To Build A Railroad: Photos from the Katy Line’s Construction to the Union Depot. 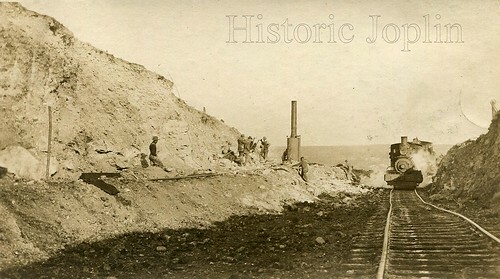 As part of our recent discovery of a photograph of the Joplin Union Depot under construction, we also uncovered photographs of the construction of the new Missouri-Kansas-Texas (“Katy”) railroad line by the Walsh-List-Gifford Construction Company. Once again, we are happy and proud to share a few glimpses of Joplin’s history that we believed was otherwise left to the imagination to envision. To learn some about the men featured in the photographs below and the life they lived, just read our earlier entry here about life in a railroad camp. 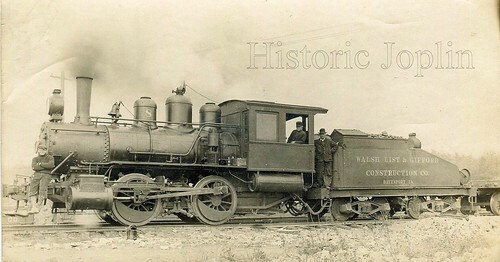 First, we have a photograph of a steam engine with the name of the company painted along the side of the accompanying coal car. The fellow resting on the front of the engine is one of our favorite elements of the photograph. Click on the photo to find larger versions. Next, we have a photograph of the railroad building at work. 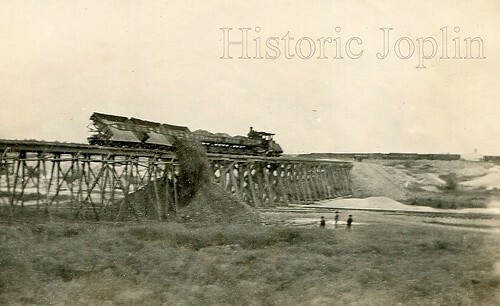 Here, the company appears to be building up an earthen support to the trestle bridge that the line is built upon. Finally, our favorite photograph shows some of the men at work (or spectating) on the side of the line while a steam engine puffs its way toward the photographer. To view a larger version of the photograph, just click on the image. This page took 0.173 seconds of computer labor to produce.